The following article has been posted in the past but it deserves to be repeated...and repeated again. Our local, independently owned Christian bookstores are dying at an alarming rate. When I owned the local Christian bookstore back in the good ol' days I could sit in church and count a handful of parishioners who patronized our store. Why didn't the others take advantage of what we had to offer? I guess I'll never know. I've been reminded again during this Christmas season just how important a Christian bookstore is in a community. Sure, you might get a book cheaper at Costco but is the clerk going to pray with you, know your kids by name and brighten your day when you stop in for a visit. I've said it before and I'll say it again...SUPPORT YOUR LOCAL CHRISTIAN BOOKSTORE. When they are forced to lock their doors...for good...you'll wish you had. In Peterborough, visit Emmaus Family Books on George Street in the Market Plaza. In Cobourg, visit Searchlight Books on Division St. just south of the 401. Back in 1970 a casual visit with R. Gordon Mitchell in Toronto led to a 15-year career as a Christian bookstore owner/operator. My father, knowing my desire to be involved in Christian bookselling, had arranged the get-together with Mr. Christian Books in Canada, Gordon Mitchell. After some discussion concerning the trade and my expression of interest, Mr. Mitchell posed the question, “why don’t you buy the bookstore in Peterborough?” We responded, “is it for sale?” When the answer was in the affirmative, the wheels started turning and I owned the Ambassador Bible Book Store in January 1971. For fifteen years I lived on the edge, struggling to increase sales, satisfy customers, offer services beyond the norm and pay the bills. As I look back on that period of my life I recall only the fond memories. Lives transformed as customers came to know Christ. Friendships forged that continue to this day. Since the business was sold in 1986 I’ve continued to be a bookseller at heart. Our local Christian bookstore is a favourite place to visit. When traveling, and I’ve been around, I always seek out the local Christian bookstore. Last fall, the business that R. Gordon Mitchell founded many years ago, R. G. Mitchell Family Books, filed for bankruptcy. Fortunately the founder was not around to see the huge BANKRUPT sign draped over the front of the building. He’s in heaven! Mitchell’s was more than a retail outlet. They had a huge wholesale business and represented many of the major Christian publishers. I made many a visit to their Gordon Baker Rd. location during my 15 years in the book business to pick up supplies. So what happened? What led to their demise? I can’t say for sure but I do know that a number of factors could have precipitated the events of the last few months. Whatever the cause, it was a sad day today when I dropped by for the liquidation auction. The retail sales area had been cleaned out of books, music, cards and the stock that was normally carried. Over the last few weeks the discounts had increased and books could be had for less than a dollar. Today the area was filled with electronic equipment, computers, printers, work stations, chairs, office equipment, telephones and other various and sundry items. Shelving, conveyor belts and other warehousing materials were available out back. As I entered the store, the sound of the auctioneer hawking his wares greeted me. It was not a welcoming voice or a pleasant smile. This was big business. Get the most you can for whatever is left. A sad day indeed! Unfortunately Mitchells won’t be the only store that will have to close up shop. The Christian bookselling industry is struggling. 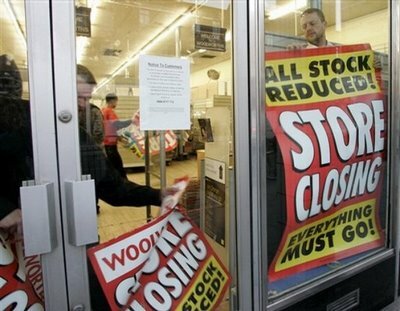 Many mom and pop shops have had to liquidate and clear out. More will follow. When I bought my store I picked up some helpful literature from our trade organization the Christian Booksellers Association. One item was a brief article entitled The Late Great Christian Bookstore. The title was a take-off on the popular bestseller at the time, The Late Great Planet Earth by Hal Lindsey. The article spoke of the struggles encountered by Christian bookstores and how they could be overcome. Sad to say, too many stores didn’t take heed. So what can be done to help prevent these tragic store closings? I have a few suggestions for what they’re worth. Support your local Christian bookstore. Give them the majority of your business when possible. The price might be cheaper if you order online but how many phone clerks have prayed with customers, taken them for lunch or spoken a word of encouragement during a difficult time? Encourage others to patronize your local Christian bookstore. Don’t expect your store to carry every Christian book available. They can’t! The smaller the town, the fewer the titles that can be carried. Ask them to order the book. Drop by even if it’s just to speak a word of encouragement. I’m committed to supporting the smaller, independent Christian booksellers.